There was no doubt the Eagles wanted nothing more Friday than to start their season by avenging the way they ended their last: a 49-21 loss to Artesia in the Class 5A state game. But the Bulldogs picked right up where they’d left off in December, scoring just 80 seconds into the game and never looking back en route to a 41-0 drubbing that saw all three units heavily contribute. Offensively, the ‘Dogs outgained the Eagles 392 yards to 186, with each team holding true to form: The bulk of Artesia’s yards – 332 – came through the air, while Belen beat out 136 yards on the ground. The Orange Crush defense logged a trio apiece of sacks and tackles for no gain in the shutout while ending seven of the Eagles’ 10 drives in their own territory. Meanwhile, the special forces delivered a punt return for a touchdown and consistently set the offense and defense up with favorable field position. The Bulldogs opened the contest on offense from their own 35 but needed just a trio of plays to find the end zone, taking the air out of Belen early with a 54-yard pass from senior Justin Houghtaling to classmate Chaz Matthews with 10:40 on the clock. The PAT attempt failed, but after the defense forced an Eagle punt from midfield, Artesia would recoup that point to cap off a seven-yard TD toss from Houghtaling to Darius Ramirez, as Matthews caught an Isaiah Weideman pass in the end zone for the conversion. Up 14-0 with 5:20 still to go in the opening quarter, another Belen punt was caught at the Artesia 20 by Caleb Brewer, who proceeded to dart through the Eagle defense on his way to an 80-yard touchdown return that gave the ‘Dogs a quick and devastating three-touchdown edge. Things would not improve for the beleaguered Eagles in the second quarter. 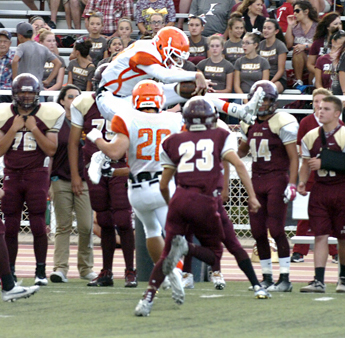 Senior DB Carlos Carrasco made a leaping grab of a Thomas Wisneski pass in the final seconds of the first to set Artesia up at their own 43, and after a 49-yard pass from Houghtaling to Jesse Gallegos propelled the Bulldogs to the Belen 11, Houghtaling would find Daniel Hernandez from four yards out to make it 28-0. The Crush would force three-and-outs to end the Eagles’ first two drives of the quarter and squashed the third with a second Carrasco INT on the final play of the half. But the ‘Dogs were unable to capitalize further offensively after a fumble and their first punt of the evening, keeping the gap at 28 at the break. 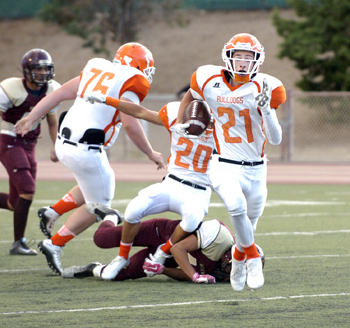 With Wisneski finally settling into the passing game to balance the attack, the Eagle offense experienced more success in the second half, breaching Artesia territory for just the second time on the night to start the third. But on first down from the Bulldog 44, a fumble was recovered by Tanner Harris, and the ‘Dogs went back to work. With Houghtaling sprinkling passes to Daniel Leon, Ethan Duff and Hernandez, Artesia reached second-and-one at the Belen 21, and from there, the junior Weideman would barrel in to set the mercy-rule clock in motion, 35-0, with 6:28 remaining in the third. Belen would reach the red zone in their final drive of the quarter, but a sack by Codey Scott – his third of the night – facilitated a turnover on downs. The offensive reserves would punt away the first possession of the fourth but would drive from their own 32 to the Belen 45, from which QB Taylor Null found Kameron Aguilar for the final score with 3:18 left to play. A Brewer fumble recovery would bring an end to the Eagles’ last drive of the game to cheers from the healthy contingent that made the lengthy trek north to celebrate the start of the year. Houghtaling finished 12 of 17 for 260 yards and three touchdowns and was 7-23 rushing on the night, while Null went four of five for 72 yards and a TD in relief. Weideman led the ‘Dogs both rushing and receiving with five carries for 32 yards and two catches for 90. 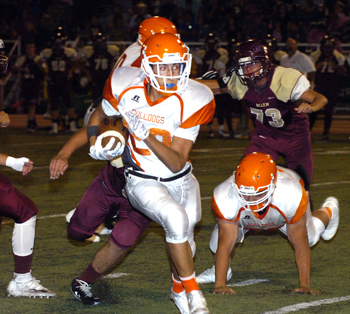 Matthews was 2-64 receiving, Aguilar 2-56, and Gallegos 1-49.
good play,” said Henderson. “Our passing percentage and overall yardage were good. Belen came out in the second half and showed they have the ability to do things pretty consistently, but we had five three-and-outs defensively and a few turnovers, and those are the kind of things that make a difference in big ballgames. 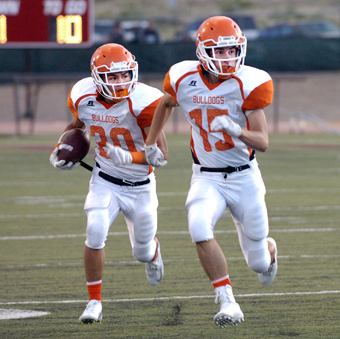 The Bulldogs (1-0) will now begin preparations for a tougher test Friday against Class 6A Hobbs at Bulldog Bowl. The Eagles – who handed Artesia their lone loss of 2014 – came up just short of Mayfield Friday in a game delayed multiple times by lightning, 41-34.